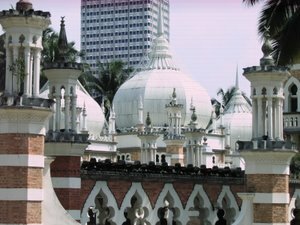 Jamek Mosque or Masjid Jamek (in Malay language) is the oldest mosque in the city of Kuala Lumpur which is still in use until today. Designed by British engineer, Arthur Benison Hubback or popularly known as A.B. Hubback, this building has a Moghul architecture quite similar in design to the north Indian Islamic architecture. 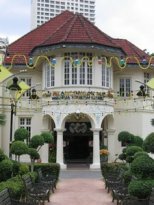 This structure has the resemblance in design with the Sultan Abdul Samad Building which was also designed by the same architect. The word "Jamek" is derived from the Arabic language which means a place where the people congregate for religious purposes. 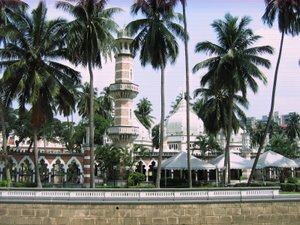 The mosque was built in the year 1907 on what used to be the Malay burial ground. The remains of the buried was exhumed and transferred to the Gombak Muslim cemetery after the prayer session. 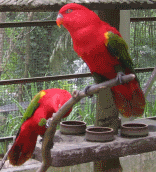 It is also located at the confluence where the Gombak river flows into Klang river. 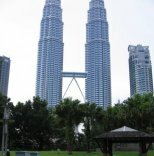 After its completion, it was officially declared opened by the Sultan of Selangor on 23 December 1909. This 100 year old mosque used to be the main mosque for the muslim residents of Kuala Lumpur before the National Mosque was opened in 1965. The 100 year old Jamek Mosque is still standing strong and used by the muslims till today. A closer view of the mosque. Notice the arch and bricks used in building the mosque. 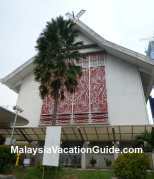 Other attractions in the vicinity of the mosque are Merdeka square, Sultan Abdul Samad Building and Chinatown. Take Kelana Jaya Line LRT or Sri Petaling Line LRT and stop at Masjid Jamek Station. The mosque is just a stone's throw away from the station.